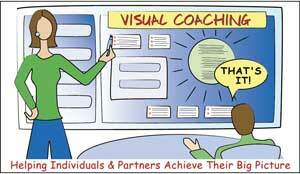 Visual Coaching: Coach Does, Client Does … Or Both! A short definition of “Visual Coaching” or “Graphic Coaching” is … the spontaneous use of writing and drawing as a mirroring effect during process work with individuals. A Client (an individual, couple, partner, family or group) is guided by a Process Professional (HR, coach, therapist, counselor, mediator, financial advisor, etc.) 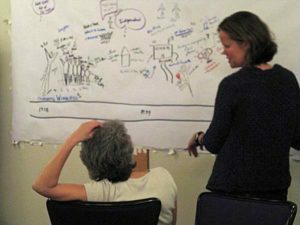 through specific processes that simulate specific kinds of thinking and/or feeling (life mapping, visioning, planning, resistance work, etc.). The Client’s perspective, reactions and answers are literally drawn out right in front of them … in-person via paper or whiteboards or digitally via web conferencing with digital tablets. My adventures with Working Visually began in 1997 in San Francisco. 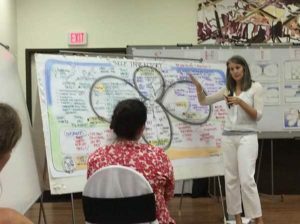 I was a corporate meeting scribe working for Visual Meetings pioneer David Sibett, of The Grove Consultants … traveling the world visually depicting all kinds of business, governmental and not-for-profit gatherings. But my real love was (and still is) using visual skills to help individual people make shifts in their personal and professional lives. I already had a Master’s Degree in Organizational Development, which equipped me for the business work I was doing. I supplemented that with coaching training (through The Coaches Training Institute), and Alchemical Hypnotherapy training (through The Alchemy Institute). And a gazillion other experiences along the way including Law of Attraction, Energy Work, Shamanic Practices. My kundalini awakening in 2009 really took things to the next level. 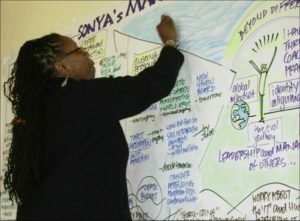 Around that time of 2009 or so, I created my Visual Coach Certification, to mentor fellow Process Professionals on how to quickly weave the power of Visual Coaching into their practices too. As I had been posting my work on the internet, so folks from across the globe were finding it, and wanting to do it too. As my Life Mission is to assist the maturation SHIFT that humanity needs to go through, I trusted that it was time to move beyond what I could personally do and expand through others. Through the amazing and diverse individuals who find their way to me, we get Visual Coaching and its magic into all sorts of professions, organizations, and regions. Visual and spiritual infiltration, haha! I’ve learned A LOT through the years of my own practice and through mentoring others into this productive and loving methodology. One of the things I really respect is the versatility of the approach. That its gets good results when the Process Professional leads the Client AND when the Client leads themselves (with the use of Visual Maps and instructions). And, I think its greatest power lies in a blend of both. As explained earlier, a Process Professional can use Visual Coaching methods with their Clientele via a variety of means. 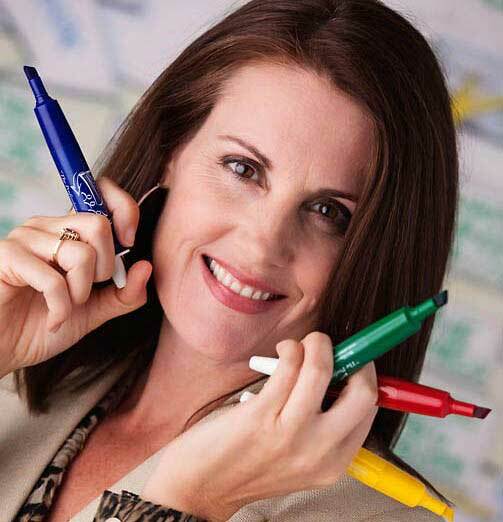 They can be in-person together in a room and use sheets of paper (small, medium or large size) or whiteboards. 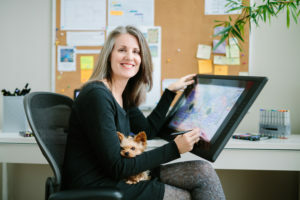 Or, they can be in different geographies, and connect via web conference and screen sharing of drawing tablets. Being in the same room together is the ultimate in human connection and rapport. However, as my own practice has gravitated to more and more online work, I’m pleased with the level of intimacy that the online environment holds (as long the technology cooperates). Whichever way they are doing the work (in-person or online) the Process Professional creates a consciously designed space for the Client to think and feel in. They are responsible for helping the Client understand the specific parameters of the work and for safely and professionally facilitating that process. And to create and share the visual record as the Client moves along. A good Process Professional can do wonders for a Client. Explain the container in ways they can understand and ethically holding space for the Client to process deep thoughts and feelings, some of which may be uncomfortable or new, to reach important ah-hahs, insights and decisions. Working with individual clients for 20 years and also running my SHIFT-IT Online Coaching Groups for over a decade … I’ve come to really appreciate the work that Clients are capable of doing themselves, on their own too. 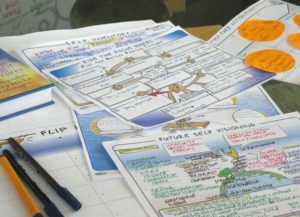 Pretty early on in my Visual Coaching work I created Visual Maps or “templates” of the various thinking and feeling exercises that I tended to do with clients. Also, spontaneous things would happen with Clients that sometimes resulted in a map being created that could assist others in doing the same thing. I now have over 30 Visual Maps at my fingertips that I play jazz with depending on the needs of my Client. Most of these maps have companion Instruction Booklets, with details explanations on how to use them. 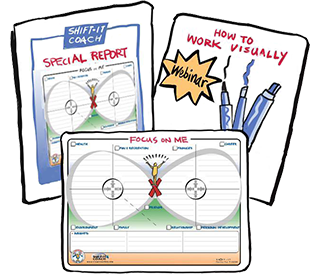 Our Visual Coaches get trained in and receive these tools via Visual Coach Certification. The great things about these Maps and Booklets is that they make ‘do it yourself’ work by the Client possible. It is not necessary for Visual Coaching work to be limited to in-person or online interaction with their Coach. They can do deep thinking and feeling work on their own. For some Clients this level of solitude, reflection and processing is ideal. 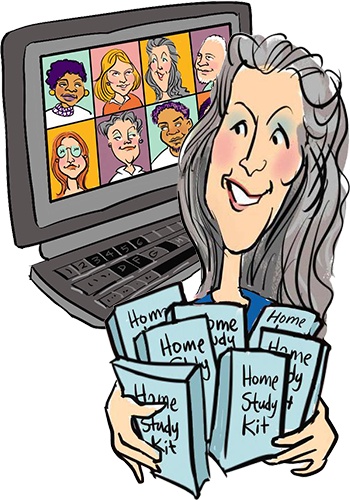 In my practice, I do have some offerings that my Clients can fully do on their own, without any interaction with me: SHIFT-IT Home Study Kit, Fundamentals of Interactive-Visuals Home Study Kit and Business Essentials for Process Professionals Home Study Kit. 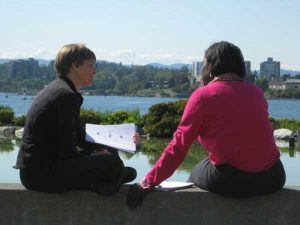 However, for most people, some interaction with a skilled Process Professional is desired or beneficial where Visual Coaching and related genres are concerned (to help with stuck places or blind spots). Also, providing some overall structure and accountability can go a long way in helping people keep going and reach completion. And it’s a wonderful thing to be seen, appreciated and encouraged by a fellow human being. Sometimes on things that no other human being has been privileged to be privy to. That’s why I think a blend between “Coach Does” and “Client Does” is ideal where Visual Coaching is concerned. It gives flexibility to the work and allows for the benefits of both poles. Interested to experience Visual Coaching as a Client? See our global Directory of Visual Coaches to find a certified practitioner near you! Designed for Process Professionals (coaches and others) who work with individuals. Cohorts are annual, beginning in early April. Two pre-requisites required: Fundamentals of Working Visually (or equivalent experience) and experiencing The SHIFT-IT Visual Coaching System as a Client. Combo Package available, get Biz Essentials as a bonus! Click Here for More Information and Application Process.